It’s a privilege to feature an interview with Dr. Janice Brown. She was a professor of English from Grove City College for 21 years before retiring in 2017. You may also know her as a specialist in Dorothy Sayers who also lectures on other writers in the “Inklings milieu,” so reads her bio. I first met Dr. Brown at a Lewis conference hosted by Grove City College. She and her husband were both sincerely warm and hospitable, something not always found in the ivory towers of even the Christian world. I hope you enjoy hearing more about her recent book The Lion in the Waste Land: Fearsome Redemption in the Work of C. S. Lewis, Dorothy L. Sayers, and T. S. Eliot which we discuss below. There seem to be several new books about Lewis every year—more than Lewis-lovers are able to keep up with! What motivated you to write a book about C. S. Lewis when there are so many of them already? My book is not so much about Lewis as about the way his most important ideas concur with those of two other luminous writers of the mid-twentieth century. My intention is not to highlight the literary achievement of Lewis, Sayers, and Eliot; but to highlight the spiritual truths they depicted so powerfully, especially truths about the nature of Christ. These three writers shone the light of the Gospel on the darkness of the modern world. My book, by setting their works side by side and zeroing in on their key themes, increases the impact of what Lewis, Sayers, and Eliot had to say. There are quite a few books that show how particular writers influenced Lewis; mine is unique in its attempt to enhance the impact of Lewis’s work by showing its congruence with the work of such significant contemporaries as Dorothy L. Sayers and T. S. Eliot. Why did you choose to place Lewis in the company of these two writers in particular? Surely there are other people he had more in common with both personally and spiritually? These three—Lewis, Sayers, and Eliot—were the most prominent figures in the revival of religious faith in England in the 1940s, what historian Adrian Hastings calls a “golden age” of “Christian literary activity.” Throughout many decades of teaching these authors I have been increasingly enthralled by the similarities in what they had to say and how they said it. I’m surprised that no one thought of studying the three of them together before now. But I’m very glad that I got to do it! Lewis was, reputedly, on bad terms with Eliot. He was outspoken in his dislike of Eliot’s poetry, and questioned the validity of Eliot’s Christian profession. Are you ignoring or downplaying this tension, in trying to make them “bed-fellows”? There were negative feelings between Lewis and Eliot during the earlier years of their careers, at least on Lewis’s side. The conflict really disturbed me: I felt like I was seeing two of my best friends at loggerheads with each other. After a lot of reading and thinking, I was able to process different aspects of the conflict and understand them. And in studying the early animosity between Lewis and Eliot I actually came to understand the two men better. In Chapter One I work through the issues behind the friction, and the way it was resolved. The warm friendship between Eliot and Lewis in later life is all the more uplifting when you know what preceded it. Do you think Sayers and Eliot can be regarded as being apologists in the same sense Lewis was? Like Lewis, Sayers was a gifted apologist; Eliot was not an apologist, at least not in the simplest sense of the term. All three of them were reluctant preachers; none of them believed themselves called to be evangelists. Lewis and Sayers were powerful expositors of theological points, and Eliot (refraining from direct defense of Christianity) produced masterful arguments for his literary position that reflected his Christian worldview and his clear thinking on religious issues. Yet it was not as expositors, not as apologists, that they most excelled in conveying the truths of the Gospel. It is, I believe, in their creative works of fiction, drama, and poetry that we find their most awe-inspiring expressions of spiritual realities. Lewis, and the others, clearly wrote on a vast number of topics. How did you decide on the six particular themes that you trace in their work—Christ, conversion, suffering, angels, pilgrimage, and time? I started with a title that alluded simply to the similarities the three writers shared, but it was not specific enough to the intention of my book. I realized I needed something more concrete and more reflective of my book’s purpose. My desire was not to just point to similarities but to emphasize the truths the three writers held in common. I also wanted to emphasize the bleakness of the world as they saw it: I needed ‘Waste Land’ in the title. I considered Hope in the Waste Land, but ‘hope’ wasn’t concrete enough. I needed a more gripping word, an image. 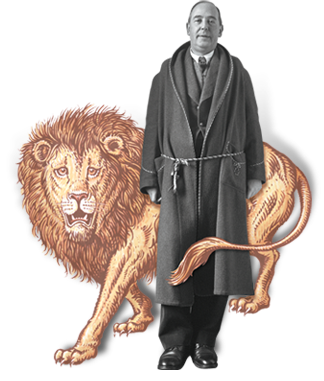 Then, as in Lewis’s case, the lion came bounding in, and I knew I had the title that reflected clearly what the book was about: The Lion in the Waste Land: Fearsome Redemption in the Work of C. S. Lewis, Dorothy L. Sayers, and T. S. Eliot. 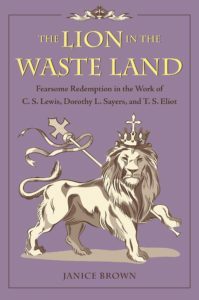 The Lion in the Waste Land: Fearsome Redemption in the Work of C. S. Lewis, Dorothy L. Sayers, and T. S. Eliot by Janice Brown is published by Kent State University Press, and currently available on Amazon at a 35% reduction from the publisher’s selling price. This entry was posted in Janice B. Brown, Zach Kincaid and tagged Dorothy Sayers, T.S. Eliot.